GUADELOUPE, IN THE CARIBBEAN SEA, is one of the four French overseas departments (similar to states in the UNITED STATES). Guadeloupe is also a French region. 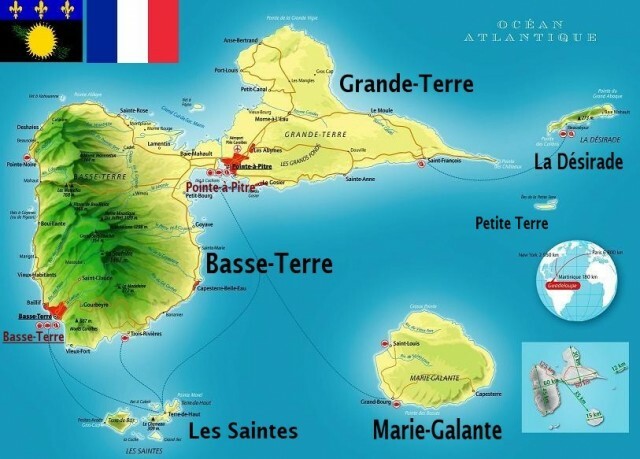 There are two main islands, Basse Terre and Grande Terre, separated by a strip of water called the Rivière Salée. Other outlying inhabited islands are dependencies, namely Saint Martin, St Barthélemy, Désirade, Marie Galante, the Petite Terre and Saintes Islands. These territories are collectively known as Guadeloupe. The climate is tropical and humid and the dry season runs from December to May (carême). During the rainy season (hivernage), June to November, temperatures generally rise. Guadeloupe’s climate is tempered by trade winds, but hurricanes and cyclones often wreak havoc in the area. Neighboring islands in the southwest Caribbean include the UNITED KINGDOM’s ANGUILLA and the NETHERLANDS ANTILLES. The landscape is mountainous in the west (Basse Terre), and thick forest covers the slopes and thins out nearer to the coast. The highest point in Guadeloupe is La Soufrière in Basse Terre, a live volcano. Low limestone plateaus and coastal cliffs are typical of Grande Terre in the East. The other outlying islands are mainly volcanic. Approximately a third of the population lives in densely populated Point à Pitre on Grande Terre island. Guadeloupe was colonized in 1635, and in spite of spells of British occupation in 1759, 1794 and 1810, the island remained a French possession. The native Indian inhabitants were massacred, and the bulk of today’s black and mulatto population is descended from the slaves imported into Guadeloupe to labor on the sugar plantations. East Indians and some Chinese and Lebanese also contribute to the diversity of the population. Slavery was abolished in 1848, and the colony became an overseas department in 1946 and a region in 1982. As such, Guadeloupe is a member of the EUROPEAN UNION. The official language is French, but French Creole is spoken by the black and métis population. Guadeloupe enjoys the same advantages as any other mainland French department or region in terms of health, education, and social welfare. The islands also benefit from special measures aimed at encouraging economic development (lower income tax for example). The islands are also popular tourist destinations for the French. Nevertheless, government subsidies are essential to Guadeloupe’s economic survival.